After leaving home on Thursday 21st August, arrive Adelaide, Australia on Sat 23rd August 2014. 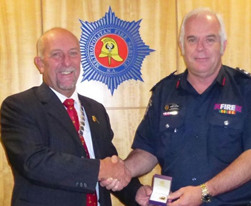 Grant Lupton, CFO of South Australia Metropolitan Fire Service (SAMFS) and Chairman of IFE Board, met and hosted me for four days. Grant had arranged for me to engage with his senior management team, including his DCFO and seven ACFOs. This gave me time to discuss issues in depth with Grant, and also to learn about local issues and how they might impact on the wider fire community. I presented Grant with his Past President’s badge as Grant had not been able to join us at the AGM and missed the opportunity to deliver his valedictory address. I thanked him, on behalf of the IFE, for his significant contribution during the last year. He had been the first President to be chairman and reside outside of the UK and had brought a positive strategic energy to the role that helped us all move forward. Grant had supported our strategic plan development, bringing clarity of vision and giving us access to the support of one of his senior team, Dr David Launder. I gave a presentation to the senior team covering the developments in the UK regarding the fire and rescue services Act, the Fire Safety Order, integrated risk management plans, the Knight review and described some of the novel approaches to dealing with this challenging environment. SAMFS Officers were particularly keen to find out how rural or low activity areas were being covered, approaches to changing working systems and to explore some of the risk targeting activities. Dr David Launder and I worked on the next steps for our strategic plan. I will cover this in a separate paper, but at this point I must place on record how grateful I am for his time and knowledge. Having the opportunity to actually sit with him and talk was so valuable, we made a great deal of progress in a relatively short time. Grant arranged for me to spend some informal time with key SAMFS staff, including Greg Crossman who had attended a previous IFE AGM. The pace and depth of discussions from both sides of the world helped improve understanding and cemented relationships that I am sure will continue to bear fruit for the good of all the fire community. The Australia Branch President, Andrew Sharrad, and the branch secretary, Christine Sharrad, gave me a whole day of their time and shared their local knowledge. It was fascinating to spend time with them talking about IFE matters and comparing fire issues and approaches. Although we have known each other for several years, spending a whole day together really gave us chance to get to know each other, and more importantly, for me to develop awareness of another perspective, from one of our largest and most active branches. I am extremely grateful to Andrew and Christine for their support. The second step in Australia was to travel to Sydney, just over one and a half hours flight away. There I met Mark Reilly, IFE Director and former Australia Branch President. Mark had planned a meeting with the Commissioner and other key players, but sadly a fire fighter had died at an incident and my visit coincided with his funeral. Time was spent well bringing Mark up to speed on IFE business. Mark manages the fire engineering team and that led to a very useful session on how we in the UK have addressed issues with timber frame buildings. I spent a few hours with Mark’s fire engineers exploring ideas. I left with a sticker that their service issue to buildings, to be fixed in the meter cupboard, to help emergency services identify any risks from the structure. I spent several days staying with Mark and I got to see parts of Sydney that I would never have discovered and continued to link up with the wider fire family in Sydney. In order to broaden my awareness of Australian life and culture Mark took me to an Officer’s breakfast meeting in Sydney’s CBD (central business district – another phrase I have learned!) and also an Australian Rules Football (AFL) game at the former Olympic Park. Whilst my primary interest was to observe the evacuation and people movement systems, it was fascinating to see a sport that has diverse roots bring together near on 35,000 people from two of Australia’s major cities. Mark posted some photos on something called ‘facebook’, which immediately got a response from IFE members all over Australia. Amazing! By Sunday, a whole week since I had arrived in Australia, I had just about got into the time zone, but my mind was full of thoughts that needed pulling together into order, to make the journey have some lasting value and effect. I am deeply indebted to Debbie and Grant Lupton, Andrew and Christine Sharrad and Mark Reilly and Kristen Ross. I do hope that I can offer similar hospitality sometime in the future. The flight from Sydney to Wellington New Zealand takes just under three hours. I had my lap top ready to make best use of the waking time to write up the journey so far. Best laid plans...I was seated next to a friendly person, we started chatting before take off- he should have been on a flight the day before but delays had occurred, but he said he should still arrive in time for the conference he was heading to. I found myself spending the next few hours learning about the fire world in Western Australia, as I was sat next to Lloyd Bailey, Deputy Commissioner! The challenges of covering such a huge land mass, observing fire development by satellite tracking, funding methods changing from an insurance levy to a property rating system, competence issues for volunteers...priceless opportunity to learn first hand from someone at the heart of such a huge organisation. Thank you Lloyd. I met Graeme Quensell, NZ Branch President at Wellington airport, he had just arrived from Auckland. We both joined Gary Ward, another stalwart of the NZ branch, and discussed IFE business over dinner. I took the opportunity to get briefed about potential activities in the week where I might be able to help the branch. 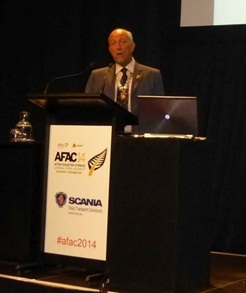 The initial driver for the whole journey was an invitation to speak at the AFAC conference. AFAC is referred to as the peak body for fire services in Australasia - the Australasian Fire and Emergency Services Authorities Council (AFAC). 2014 is their 21st annual conference, attracting over 1000 registrants for its four day sessions. 81 sponsors had taken on 130 stand spaces in an exhibition hall, and over 100 speakers were attending to share their knowledge, from all over the world including the US and UK. President of AFAC, CFO of NSW, Greg Mullins, was a key player in the opening ceremony, and kindly gave me a name check, but this was eclipsed by the welcome given in local style by the local people. Many will have seen the television pictures of their traditional welcome before rugby games, but in the flesh it was incredibly moving. One more lifelong memory. Grant Lupton invited me to a meeting of the Pacific Island fire Chiefs. The Pacific Islands Emergency Management Alliance brings together Tonga, Samoa, Fiji, Timor and a number of other island communities that are in the Pacific Ocean between NZ, Australia and the Equator. The leaders of each shared their updates and welcomed me to the table. Grant and I discussed how we might do more together, many cards and e mail addresses were eagerly exchanged. Another facet of remote community risk management, more and different cultural challenges to understand. There is a large contingent of people here in Wellington from the fire “trades”, Gore, Pbi, Bristol etc. I have got to know more of the people as we have had time to chat, and to understand their perspective about supporting learning and development in the fire world. CFO Paul Fuller, current CFOA president, joined me for a breakfast meeting today. We caught up on domestic UK issues, a little bizarre but an opportunity not to be missed. Paul is speaking today, I have a session on Thursday when I will share thoughts about the importance of knowledge and competence when dealing with the emerging risks in our world. Thank you to AFAC for supporting my journey, and the Kiwis for making me so welcome. Later this week I am meeting the NZ branch along with the NZFRS director of development, Max Hood. A friend and colleague who has taken on that role after a long career in the UK.